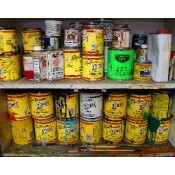 Sign Painting brushes, sign painting paint, sign painting materials, sign painting supplies, sign painter books, sign painting, signs hand painted, sign paint, sign artists, sign writting, hand lettering how to's help and supplies. Everything need to get started making Signage. Experienced staff on hand to help with materials and Education with Workshops. 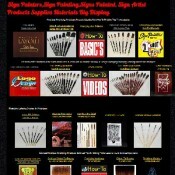 Brushes, gold leaf, Pinstriping How To's and Much More. Skate Wheel Maul StickThis is a classic and a must have sign painters tool. 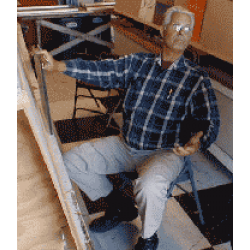 It is a great sign painting tool for keeping your hands out of difficult .. Solid Maul StickThis is a classic and a must have sign painters tool. It is a great sign painting tool for keeping your hands out of difficult areas w..
Telescoping Maul StickThis is a classic and a must have sign painters tool. It is a great sign painting tool for keeping your hands out of diffi.. Artist Paint Pallet - Left Handed Lightweight handmade stainless steel pallet with two fixed cup holders and one fixed clip for streamlined organizati.. Artist Paint Pallet -Right Handed Lightweight handmade stainless steel pallet with two fixed cup holders and one fixed clip for streamlined organizati.. This is sold as a set which includes Slotted Brush Holder and No Springs Standard Brush Box. This unit can be used as a stand alone tray, or fits perf.. This unit can be used as a stand alone tray, or fits perfectly in the Mack brush box Standard Brush Box. This unit can be used as an oil bath. 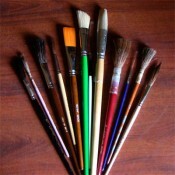 Made o..
Vertical Brush Holder - 7 SlotsStore your most used brushes in this stylish brush holder. Handmade aluminum paint brush life extender. Gravity a..
Pinstriping Magnetic Guide;Helps user make straight clean lines. Yellow Magnets for a guide, in long line automotive pinstriping. The magnets contain ..